Mazda3 is part of a long line of groundbreaking Mazda vehicles that have helped make it the best-selling Mazda in the world. 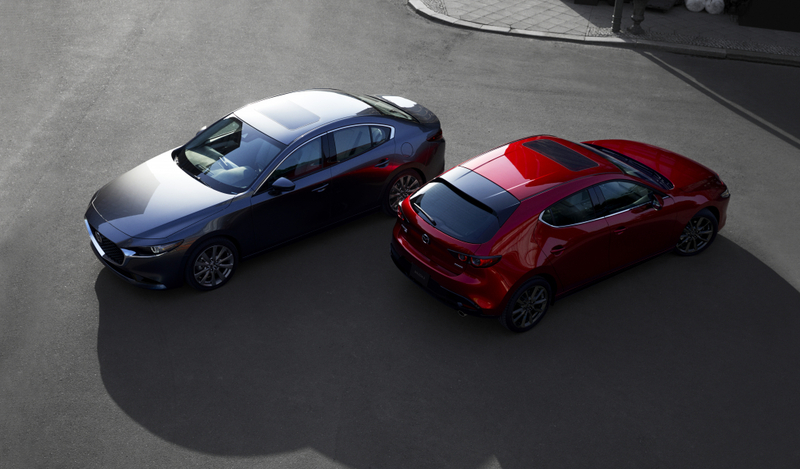 The 2019 Mazda3 sets a new milestone as the first production model to lead Mazda into a bold new era. Blending beautiful design and exhilarating driving dynamics, Mazda3 was developed to inspire and create an emotional bond with its customers in two very distinct ways. A completely new design approach was taken when styling the sedan and hatchback, each embodying strikingly different personalities. Full press kit, fact sheet and specifications available at a later date. B-roll and images available here. Mazda’s engineers could have left well enough alone for their award-winning family vehicle but instead continue to make meaningful improvements to benefit drivers and passengers in all three rows. The 2019 Mazda CX-9 features a host of improvements led by the availability of Apple CarPlay™ and Android Auto™, ventilated front seats, 360° View Monitor and a refined, retuned suspension. Full press kit, fact sheet, specifications, b-roll and images available here. For 2019, CX-5 it takes its next key step forward with a high-quality interior befitting a new top-tier Signature trim level, the refinement of the powertrain lineup with the addition of the turbocharged SKYACTIV-2.5T engine and an enhanced focus on the chassis featuring the latest technologies with G-Vectoring Control Plus. No adventure is too big or too small for Mazda CX-3, Mazda’s award-winning subcompact crossover SUV. Mazda CX-3 has exceeded expectations by providing class-above and segment-above features in a package that makes it ideal for cityscapes. Collecting praise since before it was recognized as a World Car Design of the Year finalist, the 2019 CX-3 continues to impress with exquisite design features such as a subtly enhanced exterior design and redesigned interior with new center console and armrests. There’s something freeing about getting behind the wheel of a lightweight roadster and venturing to the open road, with the ability to focus more on the journey than the destination. It is for those drivers that Mazda has spent nearly 30 years perfecting its flagship roadster, the MX-5 Miata. The MX-5 has brought joy to millions of drivers across the world, and now it has been perfected with SKYACTIV-G 2.0-liter engine with a power increase of 26 horsepower and 3 lb-ft and an increased redline from 6,800 rpm to 7,500 rpm compared to last year’s model. Cosmo. Luce. Millenia. CX-9 Signature. Mazda6. These are but a small sample of the Mazda vehicles from the past 50 years that have embodied “Mazda Premium,” a set of guiding principles that complements the automaker’s human-centric design and engineering. Mazda uses these principles to build cars and crossover SUVs that compete in a class above, at a price that is readily affordable, offering a depth of engagement with its owner that satisfies at every touch point. With vehicles like these, it is Mazda’s goal to enrich people’s lives through a car ownership experience that celebrates driving, and to become a brand with which customers feel a strong emotional connection. The re-engineered Mazda6 certainly delivers all of the above, elevating Mazda6 from its traditional competitive set into a higher class, with unparalleled craftsmanship, design and technologies for the driver who savors every moment behind the wheel. Yet, Mazda6 is also serene, thoroughly reworked underneath its sheet metal to deliver a refined experience befitting of a far more expensive car. Full press kit, fact sheet, specifications, images and b-roll available here.